SCRC was founded in 2012 to offer an alternative to high impact and traditional ball sports, engage teenage athletes who have not yet found an opportunity to compete at an elite level, and engage in the truest form of teamwork and competition. Gordon O'Brien, a sophomore (at the time) at St. Charles North High School, decided to “take up” rowing after his cousin Lee won the Gold Medal rowing a double for England’s Youth National Team in London. The closest rowing program for Gordon was 30 miles north. After almost a year of his mom, Chris Meldrum, driving him daily to rowing practice, they decided that it was time to make a change and started the Saint Charles Rowing Club. After all, the beautiful Fox River was right across their street! How difficult could it be to start a rowing club? Don't you just jump in the water and row? Well not exactly – FIRST YOU NEED A BOAT, oars, three other guys, a coxswain, coaches launch, tons of administrative paperwork,and a place to row - and the kind of determination only a parent would understand. Sam Schweizer (at the time also a sophomore at St. Charles East High School) joined. Along with Sam came two other juniors and, so, the first team was born. And we started to row. And row. The rest, as they say is, history. The rest of the story involves obstacles, roadblocks, begging and borrowing for equipment, and more “NO’S“ then anyone should ever hear. With her usual unrelenting support and SOME convincing, Julie Varrige and her daughter Cassie decided to join SCRC from Barrington. We were becoming an “almost team”. In the process of getting SCRC off the ground, we were forming amazing relationships and learning from many wonderful Juniors Rowing Clubs, College Rowing Programs and a couple amazing OLYMPIC and WORLD Champion Rowers, who all believed in our passion to offer an alternative to ball sports, provide an genuine opportunity that is unique to the area, and initiate a pathway to providing colleges with outstanding athletes. If it wasn’t for the tireless dedication of our outstanding rowers and support of parents, school districts, local businesses, St. Charles Park District, Kane County Forest Preserve, Resolute Racing Shells, Wounded Warrior Program, Team Red, White & Blue, grants and donations, we would not be able to enjoy the growth that we have so fortunate to experience. And we've just begun to realize our potential. 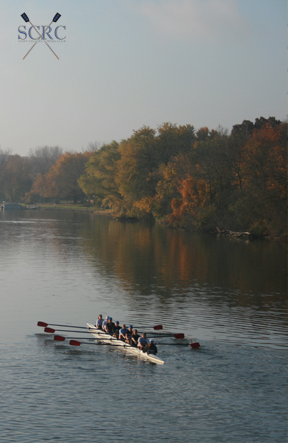 SCRC was birthed on the Fox River by the hometown crew. We are neither exclusive, elite, privileged or arrogant. Rowing is an incredibly rewarding sport; extremely difficult, yet immense in the rewards through hard work and determination it can offer. Get in a boat. This will change your life.